1. Marion MURRAY, daughter of Sir Andrew MURRAY ( -1572) and Elizabeth LOCKHART ( - ), married James PRINGLE on [Julian] 14 December 1566. She died in [Julian] May 1585 in Whitebank. 2. Sir Andrew MURRAY, son of John MURRAY and Isobel HOPPAR, married Elizabeth LOCKHART circa [Julian] 14 June 1533. He married Grissel SCOTT (NEE BETHUNE) on 8 February 1551. He died on 1 September 1572. Became ... of Blackbarony. Was a zealous Protestant. He had two sisters. "GHOST HUNT AT BARONY CASTLE, SCOTTISH BORDERS"
Built in 1536, this stunning manor house is set in 25 acres of woodland, complete with amazing views of the Tweed Valley. It is now a luxurious hotel and conferencing venue owned by Devere Venues. The history of Barony Castle is frustratingly hazy. Believed to have been commissioned by Sir Andrew Murray, it was initially built as a border tower. It later served as a family home for many years for the Murrays, an influential family in Scottish history. 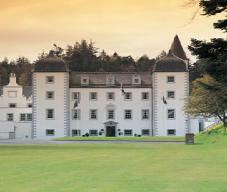 Originally known as Darn Hall, it is sometimes also referred to as Black Barony Castle. 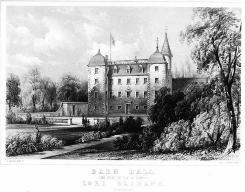 An old illustration can be seen on the right, depicting Darn Hall from several hundred years ago. John Murray, son of Andrew, was responsible for enclosing the lands and developing the property into a mansion. According to records, John was knighted on the spot after announcing to King James VI (James I of England, who would later be the target of the Gunpowder Plot) the birth of his first son, Henry, Prince of Wales. Sir Andrew Murray's other son, Gideon Murray, would later become Lord Elibank, firm favourite of King James VI. It appears that during his later years in politics he acted as Royal Treasurer for Scotland and as such was responsible for the repair and improvement of many Scottish Royal properties, notably Linlithgow Palace. It is unclear how much of his time was spent at Barony, as his main home was at nearby Elibank Castle, the ruins of which can still be seen today. It was there to which he fled after falling from favour with the King, after rumours of financial mismanagement meant that he was due to be put on public trial. Mortally offended, he took to his bed and went on hunger strike, dying after two weeks of refusing food and water. Ironically, after his death, James completely exonerated him from any wrongdoing. Gideon did, however, leave one legacy. His daughter, Agnes Murray, was the subject of 'Muckle Mou'd Meg', a legend well known to any Scot! For those south of the border, this strange tale can be read here. Walter Scott, a descendant of Agnes, referred to her ghost haunting Barony Castle and witnessed it himself while staying there. Barony Castle now holds more than a passing interest for those interested in the paranormal, for there are many curious stories of hauntings within its walls. Since it has been a hotel so many guests have reported strange goings on that a form is now left in each room for guests to fill in if they happen to experience anything out of the ordinary. The last Murray to live in the house was Alexander Fox Murray, who sold it as a hotel in 1927. It is believed to be his apparition who appears in the Tweeddale room, as if sitting in a rocking chair and staring at the fireplace, which was bricked up in the late eighties. He ignores any witnesses and slowly fades away, accompanied by the smell of cigar smoke and brandy. Many people have seen his ghost and he is now known affectionately as 'Auld Reekie'. Sir Andrew Murray was a zealous protestant. He is believed to have commissioned Barony Castle (originally Darn Hall), which later served as a family home for many years for the Murray family. John MURRAY ( -1609). John was a MP for Peebles. He died on 3 July 1609. Andrew MURRAY ( -bef1587). Andrew died before [Julian] 2 June 1587. Gideon MURRAY (1559-1621). Gideon was born on 1 January 1559. He had the title 'Lord Elibank'. He was a MP for Selkirk, Treasurer-Depute for Scotland. He died on 29 June 1621. William MURRAY ( -1638). William married Margaret COLVILLE in 1627. He died on 25 December 1638. 3. Elizabeth LOCKHART was the daughter of William LOCKHART. 4. John MURRAY, son of Andrew MURRAY, died on 9 September 1513. He married Isobel HOPPAR. ...of Blackbarony. Descended from Roger de Morref, son of Erchebaud. The estate of Blackbarony came to the family when the then owner alienated part of the lands without the licence of the Crown. Under the great seal the lands were vested in John Murray and his wife Isobel Hoppar. Burgess of Edinburgh. Descended from Roger de Morref, son of Erchebaud. He held the lands of Philiphaugh in Selkirkshire under charter of the Great Seal. He was Queen's Herdsman of Ettrick Forest and Keeper of Newark Castle. He had seven sons, the eldest of whom, Patrick, being the founder of the Murrays of Philiphaugh, Deuchar, Skikling, Melgum and Bowhill. On the 5th September 1511 he acquired Ballencrief,Haddington. He was killed at Flodden on 9th September 1513. He was Queen's Herdsman of Ettrick Forest and Keeper of Newark Castle. He had seven sons, the eldest of whom, Patrick, being the founder of the Murrays of Philiphaugh, Deuchar, Skikling, Melgum and Bowhill. On the 5th September 1511 he acquired Ballencrief,Haddington. He was killed, like so many of his compatriots, at the Battle of Flodden on 9th September 1513. 5. Isobel HOPPAR has few details recorded about her. John Murray was killed at Flodden, and his son Andrew was served as his heir in Over Menzion on 13th February, 1513-4. But the lands were life-rented by John Murray's widow, Isobel Hoppar, who married as her second husband Archibald Douglas of Kilspindie, uncle of Archibald, Earl of Angus. This liferent she forfeited owing to the political activities of the Earl, and on 8th February, 1532-3 a royal gift of the rents of Over Menzion was made to Malcolm, third Lord Fleming. The lands themselves were redeemed in 1535 by Lord Fleming from Andrew Murray by a payment of 360 merks, and Over Menzion was included in a charter of confirmation of his properties granted by King James V. on 9th April, 1538. The Fleming family retained their title until 1636, when John (Fleming), second Earl of Wigtown, conveyed Over Menzion to Sir David Murray of Stanhope, who on 17th March, 1645, got a Crown charter incorporating the lands into the barony of Stanhope-Murray. Margaret MURRAY ( - ). Margaret married William LITTLE on [Julian] 26 October 1532. 6. William LOCKHART has few details recorded about him. He was a burgess of Edinbourgh.